Matthew has always had an affinity for Japanese food and culture, and has tried to make an equally adventurous eater of his young daughter Iris — not that it sounds like she needs much help with that. When she was just six, he took her on a father-daughter foodie trip to Japan, introducing her to the wonders of freshly cooked ramen, takoyaki (fried octopus-filled dough balls), and crispy eel spines. Now, the entire family — Matthew, his wife Laurie, and Iris — travel to Japan for a full month of gourmet exploration. Based mainly in Tokyo, with a few bullet-train excursions to tourist destinations, they wander the streets in their suburban neighborhood, venturing into standing-room-only stalls that serve only one item, family-friendly pubs, and even the occasional Denny’s diner (which offers a hybrid menu of Western and Asian foods, sometimes on the same plate). Contrary to what I’d always assumed about Japan, even a major city like Tokyo is crammed full of affordable and delicious food options, including udon and soba noodles, grilled yakitori chicken skewers, barbecued eel, gyoza (potstickers), and tempura. For around $10, he says, you can consistently get filling meals made with high-quality ingredients and presented with courteous, considerate service. Even the corner 7-11 offers inexpensive bento boxes, rice balls, and healthy salads that you’d actually want to eat — a far cry from the glistening, wizened hot dogs endlessly twirling on rollers here. 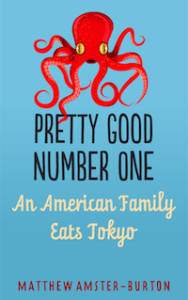 A word about sushi: Matthew and his family don’t eat much sushi in Tokyo, because, he says, that’s something you can easily get in the U.S., and most Americans — even Seattleites — already think Japanese people eat nothing but sushi. I have to defend Seattle’s honor here: while I agree that if you asked the average American to name Japanese foods, “sushi” would be the most common answer, it doesn’t mean we’re unaware of any other Japanese cuisine. Seattle’s handful of izakaya bars, ramen restaurants, and Asian supermarkets might not impress anyone in Tokyo, but it’s not nonexistent, either. Still, it’s true that there are plenty of websites, cookbooks, and blogs already exclusively devoted to sushi, and it’s well worth shining a light on lesser-known aspects of Japan’s rich and diverse food culture. The book is divided into loosely connected, snack-sized chapters, each discussing a particular type of food. Written in a chatty, informal tone and brimming with dad jokes and self-deprecating wit, it succeeds in making an intimidating travel destination feel approachable and manageable. Matthew and Iris’s enthusiasm for new experiences is obvious and infectious. Even if Tokyo has never been high on your list of travel destinations, this quick read is a fun, light-hearted introduction to Japan; and if you do find yourself tempted to consider a trip, there’s an excellent reading guide at the back that includes cookbooks, language books, and other travel memoirs.